Below is the Aladdin (Choral Highlights) (Arr. Mac Huff) - Tenor Saxophone sheet music by Alan Menken and other. 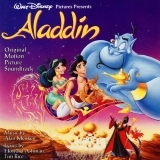 We have 15 arrangements for Aladdin (Choral Highlights) (Arr. Mac Huff) - Tenor Saxophone Brass Band Sheet Music and for SATB and other instruments.